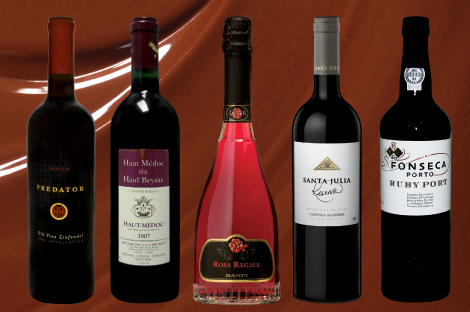 Rich red wines have always been the classic companion to chocolate, which comes to life in the presence of tannins and fruit. And Western North Carolina is lucky to have a wealth of chocolatiers making exceptional artisan accompaniments. A treat is in store as you pair these wine selections with your favorite cocoa creations—even molé sauce. This zinfandel from the Lodi appellation in St. Helena, California, sings of chocolate. Smooth and supple, this eco-friendly wine pairs well with truffles from Asheville’s French Broad Chocolate Lounge. Unoaked, but bearing gentle hints of tannin, this blend of 75 percent merlot and 25 percent cabernet sauvignon complements the richest of chocolates. Pair with a crunchy cocoa nib bar from Black Mountain Chocolate. From its voluptuous bottle to its ruby robe, this Italian rosé is a beauteous finish to a meal. Light and luscious with notes of raspberry, strawberry, blackberry, grape, and cassis, this wine pairs well with fresh fruit or a white chocolate parfait. Full-bodied and redolent of cassis, this Argentinian cabernet sauvignon shows off Familia Zuccardi’s respect for the natural Mendoza environment. It’s aged for 10 months in oak, and best complements roasted chicken with chocolate molé. Appropriate as an apéritif or dessert partner, this bottle is produced from grapes grown on the steep slopes of the Duoro Valley in Portugal. Pair it with a flourless chocolate torte topped with whipped crème fraîche or chocolate dipped cherries.